The Gamecocks face Tennessee for the second time in less than a three-week span. The last time USC faced top-ranked Tennessee during Super Bowl week. The Gamecocks were within striking distance before the Volunteers pulled away for a 92-70 victory. 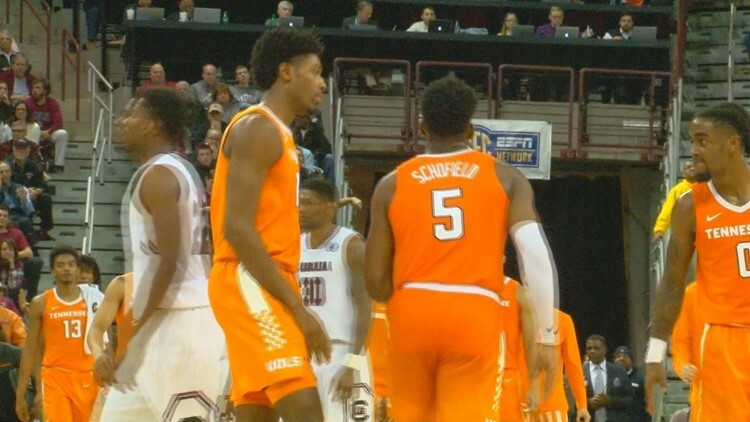 Tennessee forward Admiral Schofield scored 24 points to lead the Volunteers and won his matchup with USC's Keshawn Bryant who was held scoreless in 10 minutes of action. USC head coach Frank Martin says it's a situation of where the newcomer Bryant is being thrown into the fire to face one of the SEC's best. "The matchup is not a schematic thing. One guy is 260 pounds and the other guy is 185 pounds,” Martin said.